This setup shows a typical studio that includes a host computer with a Native DAW and a single I/O interface connecting mics, instruments, headphones and monitors. By using a DiGiGrid IOS-XL with its built-in SoundGrid DSP server, you can offload audio processing from the DAW. This affords much more processing power (up to 8 plugins per StudioRack insert). Plus, you can use StudioRack in conjunction with the eMotion ST mixer. This enables you to record and monitor with very low latency and increases the number of plugins you can use simultaneously. 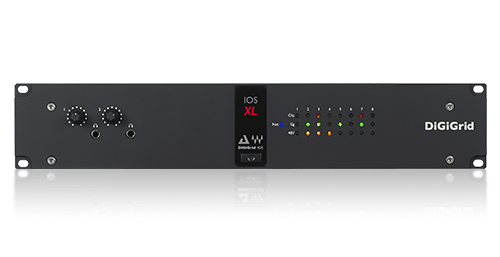 By adding the IOS-XL's built-in DSP server to your SoundGrid network you can offload your audio processing. This greatly increases the number of plugins you can use simultaneously. Plus, it enables you to use the eMotion ST mixer, which lets you create personalized monitor mixes from your DAW mix and from outside sources, and also allows you to open 64 StudioRacks and use them for low-latency monitoring. Need more I/Os? Simply connect a DiGiGrid IOX expansion unit to your DiGiGrid IOS-XL using a single Cat 5e or Cat 6 cable, and now you have 12 more inputs with top-grade preamps, 6 line outs, and 4 more individual headphone outputs. Each of the four computers is connected to the DiGiGrid IOS-XL Ethernet switch via a single Cat 5e or Cat 6 Ethernet cable. This is a classic case where the eMotion ST mixer can come in handy. Outputs from all DAWs are routed to the eMotion ST mixer, which controls all of them globally, including processing, routing, and feeds to your monitors, whether in the studio or on stage.